Posted on Saturday, September 15th, 2012 at 1:30 pm. 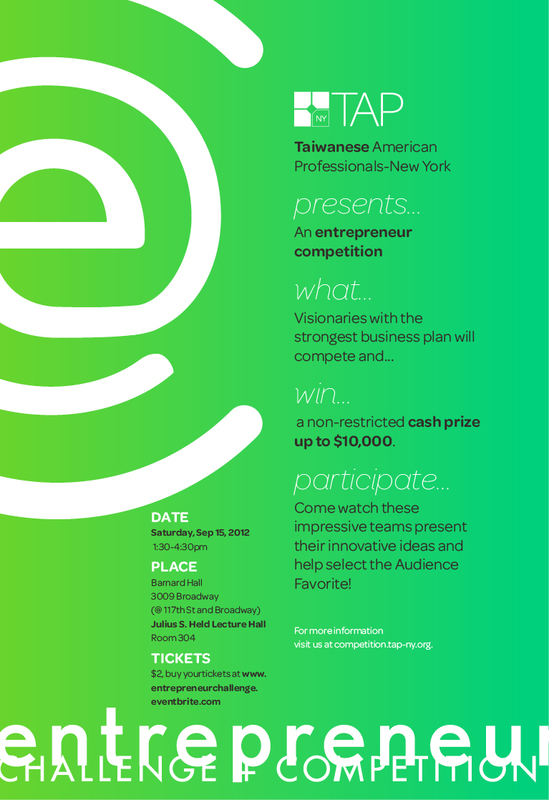 The highly anticipated Final Round of the one and only Taiwanese American-themed Entrepreneur Challenge & Competition will be open to the public on Sep. 15th, 1:30-4:30pm, and we just began selling tickets. After 2 grueling rounds, the Top 6 business plans have emerged, so join us in witnessing Taiwanese American visionaries compete for the coveted $10,000 cash prize. As the audience, you will be taking part in the competition and selecting the “Audience Favorite” who will win $1,000. Come and vote for your favorite plan – or just vote for your friends. Whatever reason, this is an event that you cannot miss!